A clock is an instrument which displays time divided into hours, minutes and seconds. A clock mainly consists of four components. A clock is a circular dial. The periphery of the dial is numbered 1 through 12 indicating the hours in a 12 h cycle. The circumference of a dial is divided into 60 equal spaces called minute space or 12 equal spaces called hour spaces. Every clock has mainly two hands, one is smaller and other is bigger. The smaller hand is slower the and the bigger hand is faster. The face or dial of watch is a circle whose circumference is divided into 60 equal parts, called minute spaces. A clock has two hands; the smaller one is called the hour hand or short hand while the larger one is called minute hand or long hand. Second hand indicates seconds on circular dial. It makes one revolution per minute. Note : In 1 h minute hand covers 60 min spaces whereas the hour hand cover 5 min spaces. Therefore, minute hand gains (60 -5) = 55 min in 1 h.
Between 11 and 1'o clock, hands are together as shown in adjacent figure. i.e., If two hands are in opposite direction. (180° apart), then they are 30 min spaces apart. This happens once in 1 h. In a period of 12 h both hands are in opposite direction 11 times and in a day both hands are in opposite direction 22 times. This happens twice in 1 h. In a period of 12 h, the hands are at right angle 22 times (2 common positions) and in a day both hands are at right angle 44 times. On the other hand, if it indicates 7.45, when the correct time is 8, it is said to be 15 minutes too slow. ix. If the real time is given and its MIRROR image is asked or vice – versa, simply subtract the given time from 11:60.
x. A broken clock is right twice a day. However, a clock which gains or loses a few minutes might not be right twice a day or even once a day. It would be right when it had gained / lost exactly 12 hours. If a watch/clock indicates 9 : 15, when the correct time is 9, then it is said to be 15 min too fast. On the other hand, if the watch/clock indicates 6 : 45, when the correct time is 7, then it is said to be 15 min too slow. Example 1: What will be angle between the two hands of a clock at 9:50 ? Example 2: A clock gains 10 s in every 3 h. If the clock was set right at 4:00 am on Monday morning, then the time it will indicate on Tuesday evening at 7:00 pm. => Correct time is 7 : 02 : 10 pm. Question: Calculate the reflex angle (greater angle) between the hands of a clock at 10:25. The hour hand moves 1/2° per minute. Question: At what time between 7 and 8 o'clock will the hands of a clock be in the same straight line but, not together? 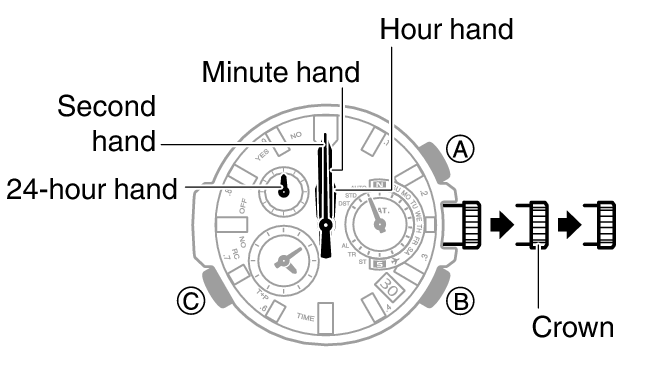 The incorrect watch gains 5 seconds in 3 minutes, i.e., 100 seconds in 1 hour. If 3600 seconds have elapsed, the incorrect watch will advance by 3700 seconds. If 1 hr has elapsed, the incorrect watch will advance by 37/36 hrs. Let the actual time elapsed be ‘t’ hrs. In time t, the watch will advance by 37/36 x t hrs. From 7 a.m. till quarter past 4, the incorrect watch has advanced by 9.25 hrs = 37/4 hrs. Question: A watch gains 5 sec in 3 min and was set right at 8 AM. What time will it show at 10 PM on the same day? From 8 AM to 10 PM on the same day, time passed = 14 hours. => In 14 hours, the incorrect watch would gain 1400 seconds = 23 minutes 20 seconds. => When the correct time is 10 PM, the incorrect watch would show 10: 23: 20 PM.